"So the nature of love is this, that the lover wants every moment to see without any remuneration, without any return. That is real love. So Lord Caitanya says, 'I am trying to see You, but You do not come. That's all right. I am brokenhearted, but still, I shall continue to love You. I cannot detract Myself from this love.' This is pure love. This is pure love. So Kṛṣṇa says, ye tu bhajanti māṁ bhaktyā. One who is, I mean to say, entrapped in such love affairs with God, don't think that God is forgotten. God is also thinking in that way. Although you do not see, but you see. Those who are advanced in spiritual consciousness, Kṛṣṇa consciousness, they always see Kṛṣṇa, always see Kṛṣṇa. 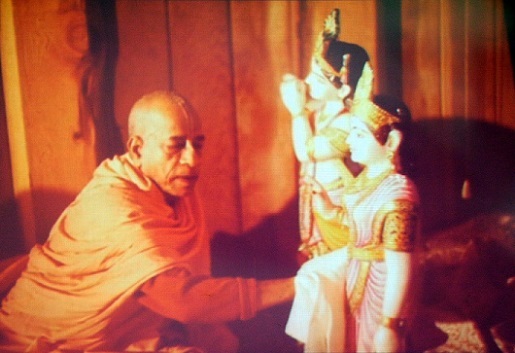 Similarly, as the devotee sees always Kṛṣṇa, similarly Kṛṣṇa also always sees that devotee. This is reciprocation. Although He is neutral... He says, 'I am neutral, but still, I cannot deviate Myself from My devotee who is always thinking of Me.' This is His admission. There is another admission by Kṛṣṇa about the gopīs. The gopīs loved Him so extensively that Kṛṣṇa admitted that 'I cannot return your loving dealings. I am unable. So please be satisfied with your activities. I cannot return.' Now, just see. God, who is so powerful, He fails to return the loving objective of the devotee. Samo 'haṁ sarva-bhūteṣu na me dveṣyo 'sti na priyaḥ, ye tu bhajanti māṁ prītyā. Prītyā means 'with love.' We should worship... The word worship is not applicable to the Supreme Personality of Godhead. The exact word is sevā, bhajanti. Here it is bhajanti. Whenever you'll find the dealings between the Supreme Lord and the devotee, the word is used, bhajanti. The bhajanti word cannot be translated into worship. Worship means pūjā. Pūjā. Just like a worthy gentleman comes; I give him all reception. This is called pūjā. There may not be love. That is only etiquette. But love is different thing. So here it is said, ye bhajanti tu. Bhajanti means render service in love. When there is question of love, there is service. Without service... We have got practical experience. Suppose if I love somebody and if I don't give him something, don't eat something or give him something eatable, then what kind of love it is? That is not love. Love means bhajanti, render service. That is love."